Greater Manchester is a metropolitan county in North West England, with a population of 2.8 million. 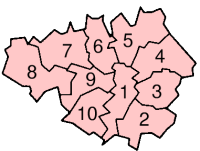 It encompasses one of the largest metropolitan areas in the United Kingdom and comprises ten metropolitan boroughs: Bolton, Bury, Oldham, Rochdale, Stockport, Tameside, Trafford, Wigan, and the cities of Manchester and Salford. Greater Manchester was created on 1 April 1974 as a result of the Local Government Act 1972; and designated a functional city region on 1 April 2011. Greater Manchester spans 493 square miles (1,277 km2), which roughly covers the territory of the Greater Manchester Built-up Area, the second most populous urban area in the UK. It is landlocked and borders Cheshire (to the south-west and south), Derbyshire (to the south-east), West Yorkshire (to the north-east), Lancashire (to the north) and Merseyside (to the west). There is a mix of high-density urban areas, suburbs, semi-rural and rural locations in Greater Manchester, but land use is mostly urban—the product of concentric urbanisation and industrialisation which occurred mostly during the 19th century when the region flourished as the global centre of the cotton industry. It has a focused central business district, formed by Manchester city centre and the adjoining parts of Salford and Trafford, but Greater Manchester is also a polycentric county with ten metropolitan districts, each of which has at least one major town centre and outlying suburbs. Manchester is a city and metropolitan borough of Greater Manchester, England. Manchester was granted city status in 1853. It has a population of , and lies at the centre of the Greater Manchester Urban Area, which has a population of 2,240,230, the United Kingdom's third largest conurbation. Manchester has the second largest urban zone in the UK and the fourteenth most populous in Europe. l Forming part of the English Core Cities Group, often described as the second city of the UK, and the "Capital of the North", Manchester today is a centre of the arts, the media, higher education and commerce. In a poll of British business leaders published in 2006, Manchester was regarded as the best place in the UK to locate a business. A report commissioned by Manchester Partnership, published in 2007, showed Manchester to be the "fastest-growing city" economically. Manchester was the world's first industrialised city and played a central role during the Industrial Revolution. Manchester City Centre is now on a tentative list of UNESCO World Heritage Sites, mainly due to the network of canals and mills constructed during its 19th-century development. David Beckham OBE (born 2 May 1975) is an English professional footballer, who plays in midfield. He currently plays for and captains Major League Soccer's Los Angeles Galaxy and is also a member of the England national team. He earned his 100th cap for England against France in March 2008. Beckham's career began when he signed a professional contract with Manchester United, making his first-team debut in 1992 aged 17. During his time there, United won the Premier League title six times, the FA Cup twice, and the UEFA Champions League in 1999. He left Manchester United to sign for Real Madrid in 2003, where he remained for four seasons. While at Madrid, Beckham became the first British footballer to play 100 Champions League matches. In his final season, Real clinched the 2006-07 La Liga championship title (Beckham's only major trophy with the club) in the final game of the season on 17 June. 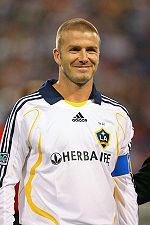 In January 2007, it was announced that Beckham would leave Real Madrid and sign a five-year contract with the Los Angeles Galaxy. ...that the Albert Medal was one of the awards given to Mark Addy for rescuing more than 50 people from the highly polluted River Irwell, Manchester, in the 19th Century? ...that the Port of Runcorn in Cheshire, England, was an independent customs port for two separate periods before becoming part of the Port of Manchester in 1894? ...that a word square found in Mamucium (pictured), a Roman fort in Manchester, may be one of the earliest examples of Christianity in Britain? ...that the women's scratch race at the 2008 UCI Track Cycling World Championships was held in Manchester and was won by Ellen van Dijk? Why not take a look at the list of stubs needing expansion, requested articles, requested images and the articles needing cleanup? Thanks, and don't forget that if you feel an article on Greater Manchester is missing, request it, or create it.